Kobayashi Ammeltz is effective in shoulder pain, muscular stiffness, nuscular pain, muscular fatigue, low back pain, bruises, and sprains. 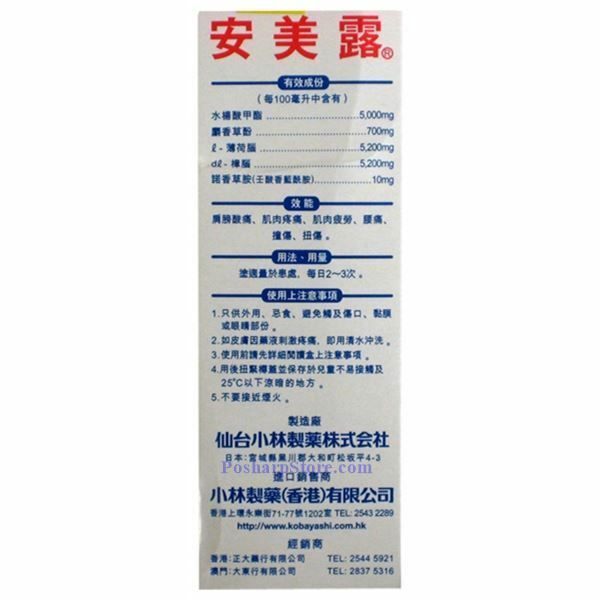 Stronger effect will be induced from applying the liquid after shower or during perspiration, it is normal effect of the liquid to the affected parts. If you feel excessive tingling, wash it off with soap and put on a warm towel to mitigate the stimulating effect. Easy to apply: The liquid thoroughly infiltrate from the rubber cap, easy to apply and handle. Compactly packed in lightweight container, ideal to carry around in pocket or bag. Just tighten the cap, to avoid leakage. Applicable for every part of your skin: Ammeltz differs from plaster, no need to bother the inconvenience of peeling off the plaster. It applies to every part of your skin including hairy part, joints and perspiration area etc. 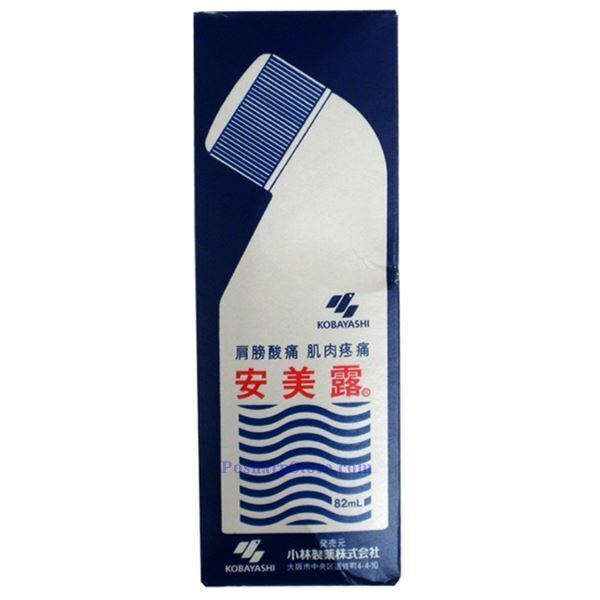 Penetrate into the affected parts, long-lasting effect: Special formula, it thoroughly infiltrates into the affected part via skin, relieves your shoulder stiffness and muscular aches effectively and long lasting. The following persons should consult a doctor or a pharmacist before use. Those who or whose relatives are of hypersensitive physical conditions. Do not apply to the areas around eyes, mucous membrane, skin affected with eczema or rash, and wound. Children should use under the guidance of a protector. Avoid contact with eyes. Should it get into eyes, wash it off immediately with cold or warm water. For serious cases, see an ophthalmologist. The person with sensitive skin should avoid applying on the same part repeatedly. Do not affix unbreathable adhesive plaster onto the parts applied with the liquid. 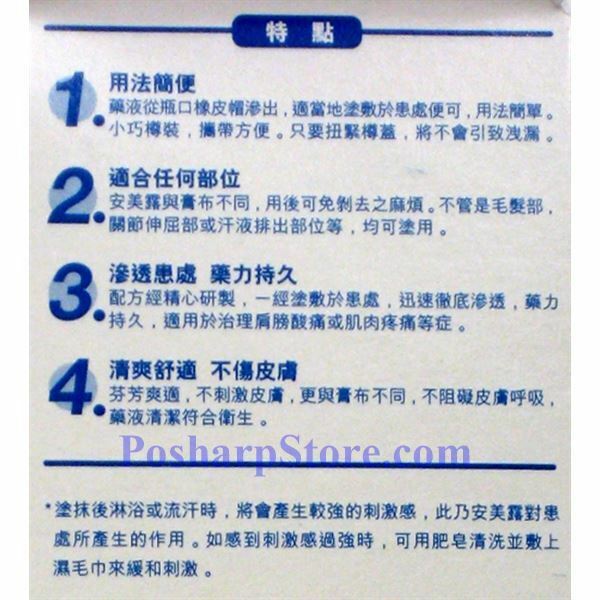 Efficacy depends on the amount applied, room temperature, applied parts and different person. Stop using if you feel very strong, itching or hurt. Refrain from warming the applied part with an electric blanket warmer or other device. If there is no improvement after its use for several days, stop using and consult a doctor or a pharmacist. 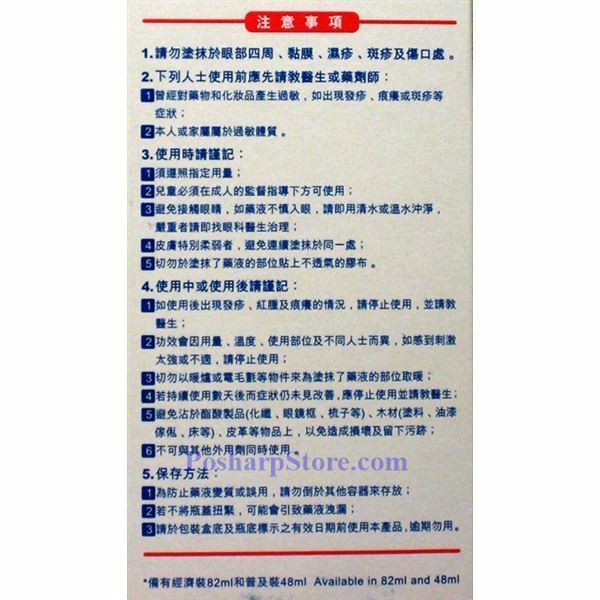 Keep away from acetate fiber and materials / furniture painted with or made of acetate plastic such as a frame for glasses and comb. The liquid damages such materials. Do not apply this product and other external remedies together on the same part. Tighten cap after use. Avoid direct sunlight, and store in dark cool place. Do not put in another container to prevent any chance of misuse and to keep the quality. It may cause leakage of the liquid if the cap is not tightened. Please use before the expiry date indicated at the bottom of the packaging box, do not use after the expiry date.